A couple years ago I made a halfhearted attempt to learn where the name originated. My pet theory was it was somehow related to Salsa de Suegra or Mother in Law Sauce. 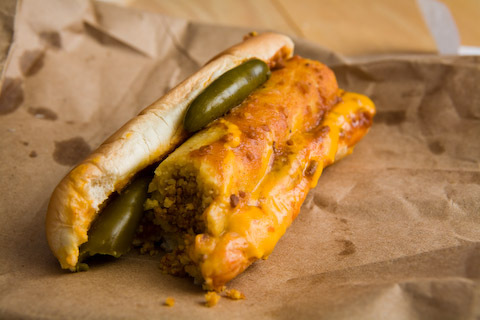 Perhaps in the first part of the twentieth century, certain Chicago hot dog stands mimicked more authentic Mexican eateries by saucing their tamales with a ladelful of chili con carne. One fact that doesn't necessarily fit with this theory is Salsa de Suegra is always a green sauce. My initial stop last weekend was Fat Johnnie’s, surely one of the classic South Side hot dog stands. Fat Johnnie’s is basically a shack among the used car dealers on South Western Avenue. They serve a halfway decent skinless David Berg sausage that in my opinion works better as a chili dog. A casual glance wouldn’t suggest there’s a tamale lurking inside that bun. Not being a fan of corn roll tamales I didn’t have high hopes for this combination but was rather pleasantly surprised. The soft steamed bun, crumbly tamale, mildly spicy chili, plus the peppers and onions, all combined to make a surprisingly satisfying combination. It’s not something I’d order often but it’s certainly better than I expected. The only other place I could positively remember serving Mother in Laws was Johnny O’s at 35th and Morgan so I headed off to Bridgeport. Johnny O’s is another classic South Side hot dog stand, occupying the back end of a bar and liquor store. Like many South Side stands, they serve David Berg products. Ordering is odd because the inside floor is lower than street level so you look down at the guys behind the counter. The chili is pretty soupy and tomatoey but seemingly homemade and not bad at all. The tamale is like a corn dumpling that soaks up the juices nicely. Again, much better than I expected. This is probably the most I ever enjoyed a corn roll tamale (and absolutely the only day I ever ordered two). As I was leaving I was confronted by the owner who had come out of the store to find out just what the hell was I doing taking pictures of his business. He turned out to be quite a nice guy and we talked a bit about hot dogs, South Side food, etc. After a while I remembered my mission and asked him if he knew where the term came from. “Sure,” he replied. “It’s because both kinds of Mothers in Law are known for giving you heartburn.” So there you have it. Good story, even if it isn’t true it should be. Rene G wrote: The chili is pretty soupy and tomatoey but seemingly homemade and not bad at all. The tamale is like a corn dumpling that soaks up the juices nicely. Again, much better than I expected. What a(nother) fabulous piece of investigative reporting! I can see how the version with the tamale in the cup of chili would be especially good. I'll be on the lookout for Mother in Laws in the Oak Park area (not impossible...particularly in Melrose Park and environs). I'm not sure about the Mother-in Law name, but it sounds like the combination (tamale/chile) may have ties to the hot tamales of mississippi, the starting point of the migration north for a lot of chicago african americans. you see the tamales served with a side of chile. Interesting link, though what really struck me, aside from John T Edge's and Seth's interesting comments, was how perfect one of AnnieB's lines would be for an LTHForum tagline. "if you're confident of the quality of your rabbit, it's a breeze." David Hammond wrote: What a(nother) fabulous piece of investigative reporting! I echo Hammond's thought, a(nother) very interesting post about a(nother) little known South Side gem. Really nice pictures. While I agree FJ's is a cool as hell old school Chicago dog stand, I've never been able to get all that enthused about the hot dogs, though the half eaten Mother in Law looks so good I (almost) feel like jumping in the car and heading out to Fat Johnnie's. In checking Fat Johnnie's menu for the Mother in Law I got a real chuckle from the fact the word vegetarian, lower left on FJ's menu, is misspelled. Seems somehow appropriate for a Chicago Dog stand. I took the following picture a couple of years ago at Fat Johnnie's. Wow....what memories a picture can release! I grew up in the Back of the Yards* and went to Quigley South, 7740 S Western (now St. Rita's) back in the '70's. For four years, I took the Western Ave. bus from 47th to the terminal at 79th. I have fond memories of early Spring days [literally and figuratively (oh to be 17 again)] of walking to Fat Johnnies after classes for a dog! A mother-in-law, to me, always was served in a bun, but as everyone knows, Chicago is a city of neighborhoods and that is how they were served in my 'hood. I wish a few of my childhood/teenage fastfood haunts were still open, so I guess I better trot down Western to Fat Johnnies before it too is gone! *The Polish deli on Ashland that my family bought our lunchmeats for school lunches was owned and operated by the Unibomber's father! The collection of links in the post, along with Rene G' descriptions, suggests perhaps both Italian and Mexican influences (though it is entirely possible that the Italians contributed little more than the name ). -an Italian cracker/breadstick, baked not fried, also about two inches wide and 1 1/2 feet long, sometimes served with chili pepper (then called devil's tongues) and so named because "only a mother-in-law could have a tongue so long"
-another instance of the long Italian cracker topped with "a snappy tapenade of marinated garlic, herbs and spicy serrano chiles with not a trace of oil", still called mother-in-law-tongues here "for their shape and mild bite"
And then there is the recipe with the ingredients listed above, wherein the Hungarian peppers are stuffed with sausage and baked with the remaining ingredients as a sauce and topped with the mozzarella. I'm not quite sure of the link between the stuffed peppers and the pastries, but a tamale served with chili sauce certainly seems worthy of the name, in light of these two uses. The tamale is stuffed with meat, as the pepper, and certainly has the starch comonent, though clearly not cracker and neither baked nor fried. And then there is the spicy sauce/chili, present in all the savory examples. The spicy kick of the chili and the shape of the tamale both agree with the above anecdotal sources of the name mother-law-tongue. 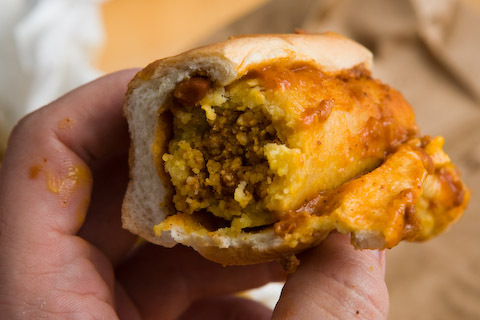 It is interesting that the sandwich is called a Mother-in-Law, rather than a Mother-In-Law Tongue, but it may be that since the "tongue" (tamale) is stuffed inside a bun, you're really getting more than just the tongue--you're getting the whole mother-in-law . Or it could just be marketing. I'm not sure Mother-in-Law Tongue would go over real well at South Side hot dog stands. Anyway, a (wee bit) more structure to the loose collection of links provided before. For what it's worth. On a couple of really broke, really hungry occasions, I've ordered the "tamale boat" at the Patio, 1503 West Taylor Street. It seems to be exactly the same thing as the Mother-In-Law (that's a much better name), except always squished into a styrofoam cup. The only modification offered is whether you want one or two scoops of chili on top. Nice compilation of information and links. But, unless I just missed something (I'm suffering from TAADS -- Tempory Adult Attention Deficiency Syndrome -- caused by too much work; as the Gumbies say, "my brain hurts") doesn't it seem quite possible that the 'mother-in-law' sandwich's name is just an independent parallel development? The trope of the overbearing mother-in-law is certainly extremely common -- if not quite universal -- across cultural time and space and to my mind, it seems plausible that the sandwich-name could well be playing off the idea of "causer of indigestion" rather than "the one of the barbed tongue"... At least for me it was the notion of "aceto" -- commë dicimmö nujatri 'ácitö' -- that came to mind when Rene G first elaborated on the tamale sandwich doused with chili. Antonius wrote: doesn't it seem quite possible that the 'mother-in-law' sandwich's name is just an independent parallel development? Oh yes, very much so...I don't mean to draw any certain conclusions, or really even uncertain conclusions. I certainly hope there is more to come in this discussion, as I find this nomenclature strangely compelling. In any event, I find "mother-in-law tongue" a bit more unusual a name to occur so widely across a number of dishes, and I'm curious about its history as well, regardless of whether there is any actual connection to Rene G's mother-in-law. The Mother-in-law makes an appearance in Kenosha. And curiously, at Nicky's, home of the Big Baby, you can get a tamale on a bun, but it's not called a Mother-in-law. zim wrote: I'm not sure about the Mother-in Law name, but it sounds like the combination (tamale/chile) may have ties to the hot tamales of mississippi, the starting point of the migration north for a lot of chicago african americans. Yes, I think that’s a very real possibility. As far as I know, JeffB was the first to suggest this (in the Veteran Tamale Shop thread I linked to above). Here’s a direct link to his post. I believe I forwarded this information to John T Edge but never heard back. I've spoken with some corn roll tamale makers but so far haven't learned much new. Thanks for that picture from Doe’s Eat Shop. I’ve long been interested in the place but now I need to go there. G Wiv wrote: While I agree FJ's is a cool as hell old school Chicago dog stand, I've never been able to get all that enthused about the hot dogs, though the half eaten Mother in Law looks so good I (almost) feel like jumping in the car and heading out to Fat Johnnie's. 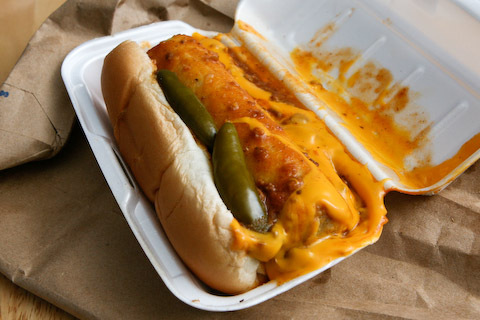 I like Fat Johnnie’s more than I should but have to agree their hot dogs aren’t among Chicago’s best. That menu board really should be in a museum though. Please don’t get your hopes too high about the Mother in Law, though it’s something that should be sampled at least once. delk wrote: A mother-in-law, to me, always was served in a bun, but as everyone knows, Chicago is a city of neighborhoods and that is how they were served in my 'hood. Happy to hear you enjoyed reading about Fat Johnnie’s. I’m very curious about the other places you went in the neighborhood. Were Mother in Laws common back then? Any memories of specific places would be very welcome. Probably a little off topic, but did you frequent Miss Muffet (northeast corner of 79th & Western, now gone) and Nicky’s (on Western just north of the bus turnaround, still there)? Aaron Deacon wrote: The Mother-in-law makes an appearance in Kenosha. Very interesting, I hadn’t seen that. I assume the owner is an old South Sider. Keep those Mother in Law sightings coming! All this talk about Mother In Laws Tongue makes me want to boil up a mess of sansevaria. delk wrote: I wish a few of my childhood/teenage fastfood haunts were still open, so I guess I better trot down Western to Fat Johnnies before it too is gone! The other day on my way to Cupid Candy, I was noticing the CVS in place of Little Miss Muffin on S. Western and that the place just north of where Little Miss Muffin was, has changed names. With Julia's Trucker's Welcome also gone, it's interesting how the Westernathon of just a few years ago is tremendously nostalgic. Miss Muffet's had two fascinating things going for it: The sign, they just don't make them like that anymore, and the burgers. Not that they were great or horrible, but the way that they were made. There was a big aluminum bowl of ground beef that the cook would reach into with his hands and pat a few times before tossing it onto the grill. Then he would further flatten and shape it with his spatula. Vital Information wrote: The other day on my way to Cupid Candy, I was noticing the CVS in place of Little Miss Muffin on S. Western and that the place just north of where Little Miss Muffin was, has changed names. With Julia's Trucker's Welcome also gone, it's interesting how the Westernathon of just a few years ago is tremendously nostalgic. Miss Muffet was supposed to move to a building on the west side of Western just south of 79th. As far as I can tell nothing has happened. I wonder if Miss Muffet is gone forever. I sure hope someone saved that sign! As for the place just north of CVS, are you thinking of Nicky’s (all I can picture)? I think Nicky’s has been there, just north of the bus turnaround on the east side of Western, pretty much unchanged for decades. One of these days I have to stop in and see if they make a Big Baby. I miss Julia’s, a fine old blue collar Lithuanian restaurant. It’s now another El Chisme, “El mejor pollo rostizado en Chicago.” Have you tested their claim? The original at 3324 W 26th, at least, looks promising. Rene G wrote: I miss Julia’s, a fine old blue collar Lithuanian restaurant. It’s now another El Chisme, “El mejor pollo rostizado en Chicago.” Have you tested their claim? The original at 3324 W 26th, at least, looks promising. Ditto on the El Chisme. Again, at least re the Cicero outpost, tried and found wanting. On a (semi)unrelated digression, (in response to delk's unibomber's father comment)... the man himself was hired by my boyfriend's high school drama teacher in Downer's Grove as a housepainter many years ago... she said he did a pretty professional job. For what it's worth. the mother in law is a must have! i will have to run down to bridgeport asap and rip into one! A couple months ago I had the pleasure of spending an afternoon with John T Edge introducing him to the Mother In Law. Together with Bruce Kraig and Pigmon, we hit Tom Tom Tamale, John's Red Hots, Veteran Tamale and Fat Johnnie's, followed by quick stops at Johnny O's and Ramova Grill. John T's Mother In Law story for NPR's All Things Considered can be found here. Unfortunately the piece was too short to include a number of details including the clear culinary highlight of the day at Fat Johnnie's. The Mighty Dog is a chili-and-cheese-covered hot dog cradled in a split tamale, all nestled in a poppyseed bun. That Fat Johnnie is a genius, a true genius I tell you, no doubt about it. If you're feeling heroic, he'll make a Mighty Polish for you too. Is this place related to the Donald's on 24th and Western? I've never been to the one on Western, but judging by the signage, I would guess they are related. They also have one other oddity on the menu, which I've never seen before: Super Taco served on Pita bread. I wasn't quite brave (or hungry enough) to try it. Oh, yeah, and they have a foot-long Polish served on French bread, too. I'm not exactly sure whether I'd consider that tempting. Binko wrote: I've never been to the one on Western, but judging by the signage, I would guess they are related. Those menu items make it sound like they are related for sure. The Western Ave. locations offers the smae things. Come to think of it, I recall seeing a sign for "the humdinger" hanging there, but I never took the time to read the fine print to see what it was. stevez wrote: Come to think of it, I recall seeing a sign for "the humdinger" hanging there, but I never took the time to read the fine print to see what it was. There's "Don's Grill" at 1837 S Western which has or had a big "Humbergers" sign. This is separate from Donald's, at 2325 S Western. It still confuses me a bit, and I see them semi-regularly. I've been by the Don's grill on Western many times and every time I see the place I start flashing back to the early '70's. Am I crazy or was there at one time a Don's grill (humburgers and all)on Milwaukee Av. just south of Superdawg ?